Whole Foods Market Mid-Atlantic region Hot Deals are up! Case Discounts of 10% off anything you can purchase by the case – 10% savings before coupons *inform cashier you are purchasing a case to ensure you get the discount! 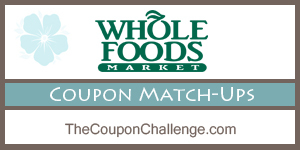 See more weekly Whole Foods Market Deals!